Unique, distinguished and one of a kind! For an exclusive dining experience, journey to the quaint and charming Crystal Hut, perched atop Blackcomb Mountain at 6000ft. Be treated to our chefs local interpretation of a traditional candle-lit fondue dinner accompanied by fine wine, followed by fresh baked fruit pie served hot from our wood fired oven. From the deck of the rustic cabin, enjoy a rich array of alpine colours and panoramic views of the surrounding Coast Mountain Range and the twinkling lights of Whistler Village below. The evening is complete with live entertainment featuring local up and coming musicians. This tour operates from 15 December 2018 - April 2019. This tour is also available by a luxury, heated 19 passenger snowcat. 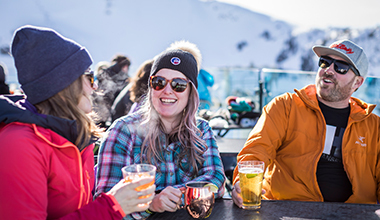 Snowcat option available from $209 per person. 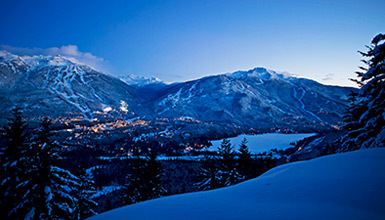 Experience the serenity of the high alpine, the twinkling lights of Whistler Village and the active nightlife of Blackcomb Mountain, all from the comfort of our luxury, heated 19 passenger snowcat. This is the most deluxe and cozy way to travel to an alpine dinner on a brisk winter evening.